Sandals Resorts International have been using the GULL system at all their properties since 2008. A number of senior managers have recently completed the GULL pathway to professional Doctor of Management. Winston Anderson is not only a leader but a champion of action learning at work. He has inspired and encouraged many of his staff to engage with the GULL system and to facilitate this, he has created a resort-wide framework termed the ‘Five Pillars’ that has enabled the entire team to develop and implement innovative ways of managing one of the Caribbean’s most successful resorts. At the heart of Winston’s model is a method for continual innovation in guest service –the objective is provide ‘outrageous’ guest service that is consistently higher than guest expectations. GULL’s action learning system provides an operating system for recognizing learning at work and certifying the outcomes. The successful application of this system owes much to it’s champion at Sandals Resorts, Dr Phillip Brown, Group Director, Human Resources, Training and Service Standards (HTSS). Phillip leads the HTSS division and has been instrumental in designing Sandals Corporate University (SCU) which provides an ‘own brand’ action learning option for all employees at work, in partnership with GULL. Phillip’s vision is to enable all employees –regardless of whether they have prior qualifications -to have the opportunity to work towards a professional Bachelor degree at work. GULL’s system enables this and the action learning process yields much more in terms of its potential for individual and organizational transformation. 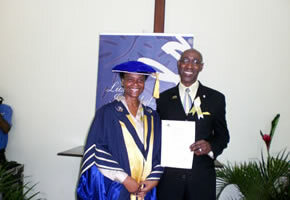 Pictured left: Novlette Symister, Administrator, HTSS receives her GULL professional Master degree from Dr Phillip Brown who attained his GULL professional Doctor degree on Tuesday 20 July at the Montego Bay regional graduation event held in the Frank Warren Chapel, Sandals Montego Bay. As Sandals Corporate University with GULL seeks to build on the firm foundations that have been established during the past few years, we have sought to recognize the company’s outstanding leaders. We have made three honorary awards to senior executives who have played and/or are playing a pivotal role in the on-going development of the company. Merrick Fray has been with Sandals since its inception and he attended the Sandals Regional Graduation Event in Montego Bay, Jamaica to receive his honorary award. 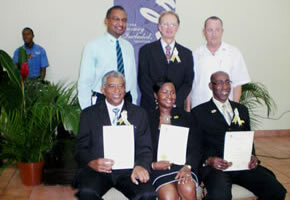 Pictured right: Back row left to right: Wayne Cummings, Group Director, Business Processes & Administration, Richard Teare, Howard Spittle D Mgt, General Manager, Beaches Boscobel; Front row left to right: Merrick Fray, Managing Director and recipient of GULL’s honorary Doctor of Management, Marsha Ann Donaldson-Brown D Mgt, Director of Resort Sales, Phillip Brown D Mgt, Group Director, Human Resources, Training & Service Standards. Although GULL is well established in the workplace, it is our ambition to take GULL to the wider community throughout the Caribbean. The process has started in Jamaica under the leadership of Norma Taylor, who has senior tourism management experience. Norma is working with a group of mature, senior managers to explore the wider applications of the GULL system among communities and other groups with limited access to further and higher education. 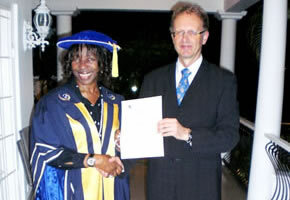 Norma will complete her own GULL professional Doctor degree in November, 2010 and at that point, she and her team will begin a large scale cascade of the GULL system via the Church and other organizations throughout Jamaica. 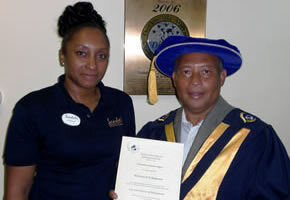 Pictured left: Norma Taylor, facilitator of the GULL Jamaica Open group, receives her professional Doctor Level 3 Diploma in Montego Bay, Jamaica. Although action learning is well suited to workplace applications, it is sometimes viewed as a ‘second best’ option to academic alternatives. However, as in any organization there are early adopters who realize that the process is helpful, practical and that it enables them to achieve their professional goals. A strong group of SCU-GULL advocates has emerged in the Ocho Rios region, Jamaica, led by Dr Howard Spittle and members of the HTSS team. It is encouraging to see that those who start the process want to continue to the next level and additionally, that they encourage others to participate. Above: Team members from Beaches Boscobel, Royal Plantation Ocho Rios, Sandals Dunn’s River and Sandals Grande Ocho Rios at the regional graduation event held on Wednesday 14 July 2010 at Sandals Grande Ocho Rios. The guest speaker (pictured right, front row was Dr Howard Spittle, General Manager, Beaches Boscobel. During the early phase of the GULL system implementation at Sandals Resorts, the majority of participants were relatively junior team members. The impact and personal and professional development demonstrated by the initial participants both surprised and delighted senior management. In some cases, the impact of action learning was so profound that participants reported dramatic growth in confidence, skills and capability. Many were promoted and senior management saw the transformation potential for SCU-GULL. Now there are more senior managers engaged, including General Managers who play a key role in resort leadership. Above: Team members from Beaches Negril, Grand Pineapple Negril and Sandals Negril at the regional graduation event held on Monday 19 July 2010 at Beaches Sandy Bay, Negril. The event was supported by all the property General Managers who have formed their own Doctor of Management group to encourage and support the growth of SCU-GULL in the region.